Today is May 1, 2012, we are celebrating the day for all workers in public and private sector in the country. 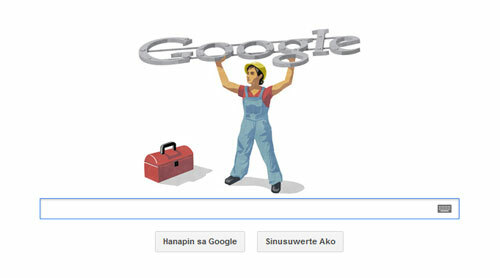 And as Google Philippine pays tribute to all Filipino workers, they changed their doodle into a Man carrying the gray Google logo. Labor Day is a official regular holiday in which annually celebrated for the economic and social achievements of workers. But not all the country have the same date to celebrate the Labor Day. For example in United States of America and Canada they celebrating it on first Monday of September, while in Pakistan, India, Malaysia, Syria, Cuba and Philippines is on the first day of May. On the other hand, I would like to thank Google for replacing their doodle to showed support to all hard working people in the world, specially here in the Philippines. Mabuhay ang mga Manggagawang Filipino! Comments or suggestions about "Google Doodle on Labor Day" is important to us, you may share it by using the comment box below.